Grapevine crafts are easy to do and are an inexpensive accent to your home dÃ©cor. 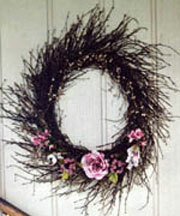 Natural grapevine wreaths are a great addition to any home. It is easy to make the wreath yourself but if you canâ€™t get the vines then you can purchase the wreaths at any craft store. I've been doing this for a long time and it's easy and fun. Grapevine wreaths aren't that expensive and they make a beautiful door ornament, or wall hanging. The first step in the production of any product from the vines is the collection of the vines. Most crafters harvest the vines from nearby forests or roadsides where vines are often abundant. Making your own grapevines wreaths can be both fun and rewarding. Several benefits to making your own are of course cost, plus making the size, fullness and shape you desire. You can make just about any shape you want. I have some articles below that will show you how to make different shapes. Now you will need to choose the materials you want to apply to your grapevine wreath. To determine the overall look you are trying to achieve you need to take into consideration the place you will be hanging your wreath. You can decorate your wreath with just about anything. Try dried flowers, silk flowers, paper ribbon as well as regular ribbon or real leaves that are treated and preserved. They remain flexible and are available in many colors and varieties, and will keep for many years. Flower picks are available from craft stores. They are inexpensive, but you can make your own picks from clusters of wheat, pinecones, dried flowers, and other materials, wired together into a small bunch. Using a hot glue gun to attach most of your decorations to grapevine wreaths can save you a lot of time. It also makes it easy to add something to balance out your wreath. Eucalyptus, lavender or moss will give you a cottage garden look. Dried Hydrangeaâ€™s will make a elegant formal decoration. Choose colors of flowers for each season. If the wreath is for inside, just match your room colors. 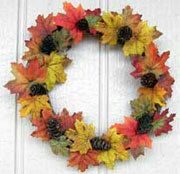 You can make grapevine wreaths for any season or holiday. I have seen Easter wreaths that are made with eggs and they look really nice. Grapevine wreaths are also really good for craft fairs, especially around the holidays. They will sell like crazy because people buy them for their homes and also as gifts. There are many grapevine crafts ideas below so have fun looking around. Check back often because I will be adding a lot more. If you have any questions or grapevine crafts please contact me and I will add it to my site. Make your own grapevine wreaths. Learn how to make your own beautiful grapevine wreaths the easy way. Make your own button grapevine wreath with those old buttons you have in your attic. 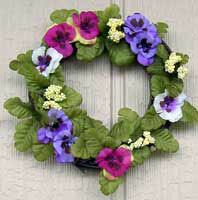 You can make pansy grapevine wreaths that will bring spring into your home.